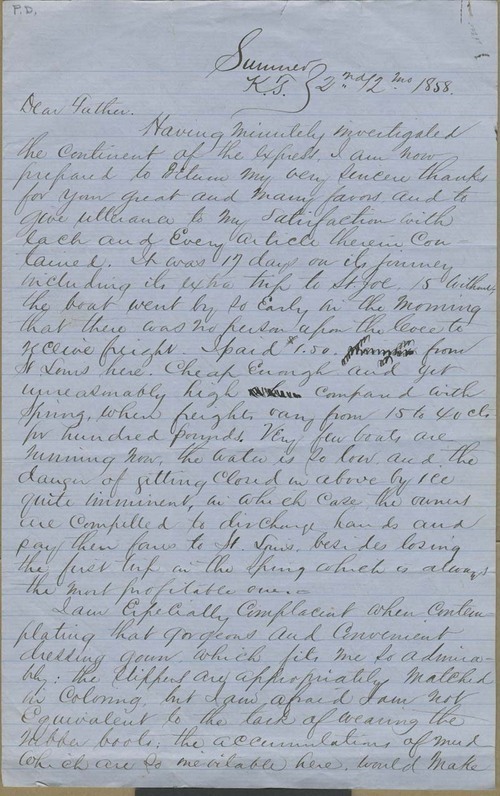 Ingalls opened this letter with comments on the weather ("the fine days are so beautiful as to compensate for a large amount of ambiguous weather"), problems with shipping freight, and mention of various items of clothing he had received from the family, but he gave considerable attention to the city of Atchison, its newspaper (Freedom's Champion) and its growth. Sumner compared favorably, as to future prospects, in Ingalls's estimation, with the location of future railroads the key to success. He also encouraged his father to make a spring visit so he could assess for himself "the opportunities for business and the prospects of progress" in this "most important party of the continent."